When you’re just two guys with a big startup idea, you can’t afford to waste your time on “pretty good” product ideas. You have to milk every ounce of value from an hour, and that extends all the way from deciding how to strip your product vision to it’s barest essentials (the “minimum viable product” or MVP) down to choosing the right development tools. While building GoodApril, Benny and I chose to use Balsamiq as our wireframing tool because it’s easy, affordable, and most importantly, fast. I can turn out high-level pages in minutes, and I can go back to add in greater levels of detail and precision quickly and easily. Our designer loves its inherent “sketchiness,” which makes it clear that our output is merely a guide, freeing her to generate creative and beautiful pages using our content as a starting point. Two years ago, my Co-Founder Benny Joseph had one of those frustrating-to-the-point-of-inspiration moments that spawned the idea for GoodApril. He realized that he had wasn’t going to be able to deduct from his taxes the thousands of dollars of student loan interest he’d paid off the year before by a tiny margin. He could have deducted the interest and lowered his tax bill by hundreds of dollars had he just contributed 2% more to his 401K. If he’d just known that a few months earlier, he could have easily made the change – but how are he have possibly know his tax outcome before he filed? Thus: GoodApril. We will help people prepare for and pay less in taxes by providing in-year tax planning and advice, through an easy online service. Our vision is to leverage financial data aggregation and tax savings algorithms to create an online “tax accountant” that follows you through the entire year (automatically, and unobtrusively), giving you a “heads up” when your taxes need your attention. Building our full vision will take a bigger team, and time, however – we obviously couldn’t build it all at once. We had to start smaller. So how to pick the right FIRST product? After interviewing and surveying hundreds of taxpayers, we thought we knew what our first product should be: a real-time tax forecast. We set to work building out wireframes in Balsamiq, and over the course of about two weeks, we had a solid vision for how it would work. “Somewhat”?! This was supposed to be our big “debut”! This was the product that would prove that customers needed a solution like GoodApril. “Somewhat interesting” wasn’t going to cut it. We went back to the white board, begin generating alternative wireframes, tested two new concepts, and discovered what we needed: people loved our new “Tax Checkup” concept. Reactions to our Balsamiq wireframes showed that potential customers, advisors, and investors were much more excited by this new direction. Knowing we were on the right path, we then sunk our teeth in on design, product planning, and development. 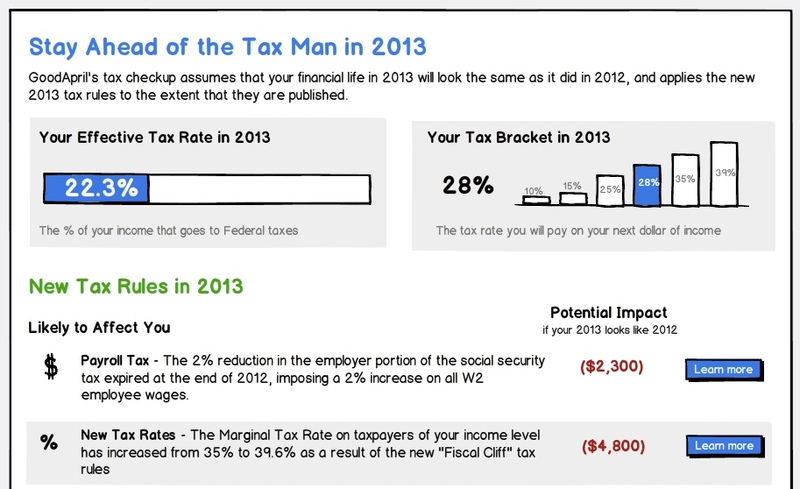 A month and a half later, we’re pleased to be on the verge of launching our Tax Checkup. It’s powerfully simple: a customer sends us their 2012 tax return after they file, and we analyze it. We generate a custom report telling them how much more they are going to owe in taxes in 2013 as a result of the 7 major tax changes coming this year, and identify several potential actions that they can take to pay less. It’s doesn’t update itself automatically, it’s not exhaustive in its evaluation of possible tax savings, but we’re confident it’s going to save taxpayers $100s or $1,000s in taxes this year. And that’s a pretty great start. 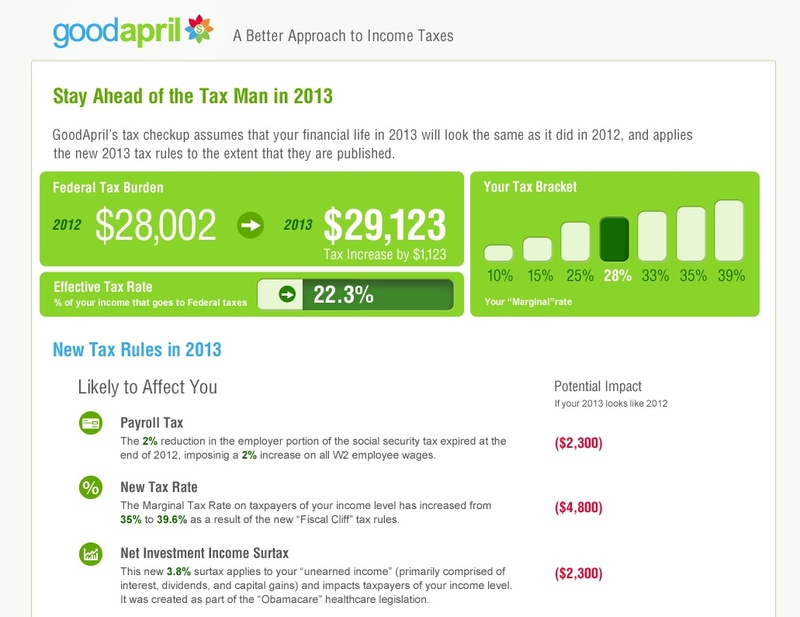 Check out GoodApril and sign up to get your own free Tax Checkup. ← Business Plans are Dead. Their Replacement? Startup Accelerator Applications.